What started as HB 360, died, and was brought back to life in the form of 78-67 vote to amend SB 215 finally died a final death in conference. On Saturday, May 25th, the Senate adopted the Conference Committee Report on a 31-0 vote, and on Sunday, May 26th, the House adopted the Conference Committee Report on a 135-5 vote. Bad legislation highlights the sausage making (and unmaking) in the legislature&apos;s processes. 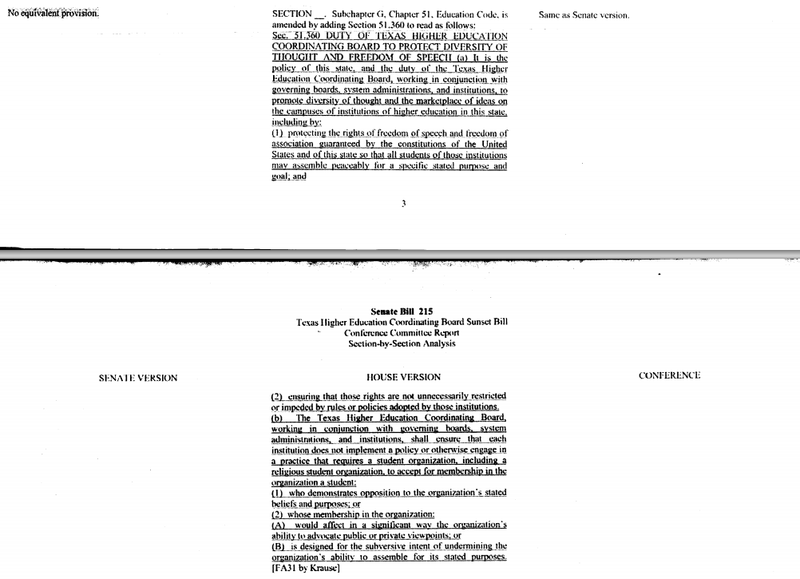 Click below the fold to see the actual page from the conference report which killed Rep. Matt Krause&apos;s bill to allow student organizations to ignore university non-discrimination policies.Click the image to enlarge. Everything you expected right?